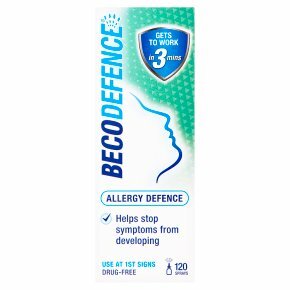 Use Becodefence as soon as you feel the first symptoms, before the allergic reaction has fully developed. Suitable for athletes, pregnant & breast feeding women. Instructions: Apply 1 to 2 sprays into each nostril, 2 to 3 times a day (works up to 6 hours). Becodefence is suitable for adults and children over 12 years of age. 1 Shake to activate Shake vigorously 4 times upright & 4 times upside down before use. Shake vigorously before each use. 2 Hold the pump for 5-10 Seconds Prime the pump by small sprays in the air before initial use. 3 Spray Apply 1 to 2 sprays into each nostril. 4 Use before the onset of allergic reaction. Can be used 2-3 times a day. Effective for up to six hours. Read package insert. Use only as directed. Children should use Becodefence Kids under adult supervision. For adults and children over 12 years.<br>Keep out of the sight and reach of children.